Included, Official Fransat Viewing Card and Cahors VeOx Fransat HD Set Top Box PVR Ready unit, just add a USB device to record your favourite programmes. Enjoy bright and clear HD pictures and excellent audio quality of FRANSAT HD channels plus many free channels via EUTELSAT 5°W satellite. VeOx allows you to record TV programmes onto an external USB device. It also offers many features such as software update via satellite, EPG, favourite lists, teletext and subtitles and a 12 V power supply for mobile use in caravans, boats or campers. VeOx meets all your requirements. 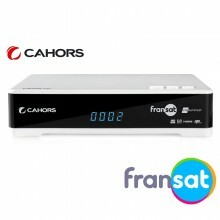 Click the button below to add the Fransat HD Cahors VeOx Official French Digital TV Receiver and Card to your wish list.